Great films are often a collection of little moments which form a larger gestalt. A case in point: The sushi chef competition scene in “East Side Sushi.” It’s one of the best sequences you’ll see in any film this year. Like the rest of the movie, it’s a smart scene, played with equal parts comedy and drama, as four sushi chefs, three of them Japanese, vie for the title of “Sushi Champion.” The fourth chef is our heroine, Juana, a single mom of Mexican ancestry who has improbably yet amazingly ingratiated herself into the male-dominated, highly-traditional, world of sushi chefs. Watching the scene unfold, there’s an emotional investment in Juana’s character and the outcome of the competition. It’s the movie’s defining moment; We’ve followed the journey of Juana, played by Diana Elizabeth Torres, from abandoning her father’s Fruitvale fruit cart business after a violent robbery, to working at jobs which offer no possibility of advancement – or health benefits – to being hired as an assistant prep cook at a fictional Japanese sushi restaurant, Osaka (a stand-in for the real-life Coach Sushi, on Grand Ave.). Despite being told, “we don’t usually hire women,” she gets the job. Juana’s a quick learner, and the knife skills she developed peeling fruit and working in Mexican restaurants serve her well in cutting sashimi and ngiri. She’s taken under the wing of Aki (Yutaka Takeuchi), an amiable sushi chef, and practices her craft on her family — substituting poblano for nori, using chile relleno, pico de gallo, and Tapatio hot sauce as ingredients — but runs afoul of Mr. Yoshida (Roji Oyama), the restaurant’s traditional-minded boss, who’s worried Osaka’s authenticity will suffer if he allows Juana to join the other chefs at the front of the restaurant. The larger subtext—of a patriarchal man afraid of female empowerment – is evident. Yet Juana is not only determined, she’s the fastest, most inventive sushi chef at the restaurant. With Aki’s encouragement, she sets her sights on her goal, and enters the competition as a way to prove her worthiness. She also earns the support of her initially-skeptical father (Rodrigo Duarte Clark), the film’s other patriarchal figure. Stories like the one “East Side Sushi” tells are the reason why people love indie films. The storyline is refreshingly non-Hollywood, and non-cliché, the characters are personable and realistic, and the writing and direction of Oakland native Anthony Lucero (making his directorial debut) never hits a false note. Juana is a feminist heroine without an academic background, a real-seeming person who embraces an adopted culture without diluting her own. Her passing resemblance to Frida Kahlo makes it easy to imagine her as a rebel and visionary. Her ideology, however, comes down to one of social inclusion: “in every great restaurant, there are great Latinos in the back, prepping the food… I don’t want to be in the back,” she says at one point. Stories like the one “East Side Sushi” tells are the reason why people love indie films. The storyline is refreshingly non-Hollywood and non-cliché, the characters are personable and realistic, and the writing and direction of Oakland native Anthony Lucero (making his directorial debut) never hits a false note. Amazingly, the film was made for less than $35,000, yet it feels rich in storytelling, unlike films with exponentially-higher budgets and empty souls. 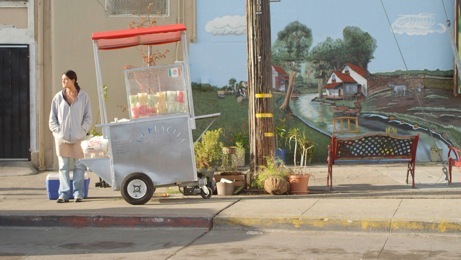 The other main theme of the movie is one of cultural intersectionality and embracing diversity, for which Oakland proves the perfect backdrop. Mexican sushi may seem like an oxymoron, but Juana’s “Mayan Sun roll” is a hit with customers, and her signature roll, the poblano-infused “Green Diablo,” plays with the idea that traditional culture can and should be updated and innovated upon. Part of the fun for local audiences will be in identifying all the Oakland locations referenced in the film, which include KTOP, Tacos Sinaloa, the Main Library, Aztek dancers, the salsa dancers at the Lake Merritt pillars, and cultural murals in the Fruitvale District. Foodies, especially sushi aficionados, will also enjoy all the focus on the behind-the-scenes food prep, such as the correct ratio of rice, vinegar, sugar, and salt to make sticky rice. Be forewarned, though, that watching this movie can stir a powerful craving for sushi which may cause a post-film run to your favorite spot. “East Side Sushi” opens today (September 18) at the Grand Lake Theater in Oakland, the Elmwood in Berkeley, and the Kabuki in San Francisco. For more information, visit www.eastsidesushifilm.com. Categories: Film review, Uncategorized | Tags: Anthony Lucero, California rolls, Coach Sushi, cross-cultural intersectionality, Diana Elizabeth Torres, East Side Sushi, Fruitvale, ngiri, Oakland cinema, sashimi, sushi, Yutaka Takeuchi | Permalink.